September 30th, 2005 admin	Enter your password to view comments. I set my glasses down on the bathroom counter for a moment just now, then picked them back up and put them on. Moments, later, a HUGE HORRIBLE SIX-LEGGED MONSTER crossed my field of vision. Last day of yarn contest – and a pattern! It’s the last day for the Donors Choose yarn contest! Donate $10 to Donors Choose, e-mail me your receipt, and I will enter you in a drawing to win loot from my stash! Each $10 enters you again. The link above has details and pics of the yarn that’s up for grabs. Donors Choose is currently part of an Amazon.com charity contest, where the charity which raises the most money by today earns up to a million bucks in matching funds. That’s a lot of pencils and notebooks. Also, through today, all donations to Donors Choose are going to fund classroom supplies for Katrina kids, who have been absorbed into school systems which already didn’t have enough for their own students. I shudder to imagine a child losing his or her home, starting over in a new school with new kids, and not having what they need to feel comfortable and succeed. This is a good way to get things directly to a child without worrying about exactly where your money is going. Right now, everybody who’s donated has a chance to get something. I’ll root around and dig up a few more good quality things to offer if it looks like that will change. 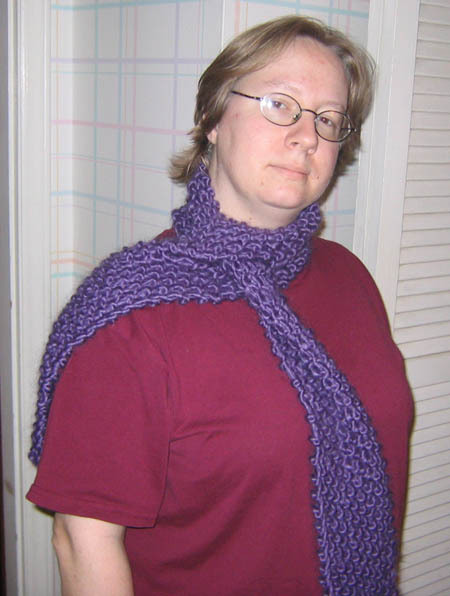 Because I hate to beg and not offer anything in return, here’s a quick and easy scarf pattern for a rank beginner. 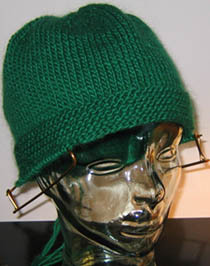 was thoughtful and kind enough to post a glowing review of the Jayne hat kit in the knitting community. And I can’t believe I didn’t think about the fact that every pattern I’ve ever seen has had a picture of the finished product on it. D’oh! Thanks for the good feedback, ! In other news, I agree with ‘s hearty “WTF?? ?” to last night’s Lost. Two more days until the Serenity premiere – and I’ve just realized that having someone come over and watch my kid means that they’ll actually be IN MY HOUSE which means I need to clean it enough so that it at least isn’t a health code violation. I’ll be doing that in my voluminous spare time. Ahahahahahaaaaa! Spare time! I slay myself. Woo! Yes, I know he’s not referring to my Jayne hat specifically, but it does make me happy that the hat’s being mentioned at all. It’s more confirmation that it’s cool with Joss to have everybody out there building up the Jayne hat army. I personally choose to believe that he had a “down in front!” moment in a theater somewhere. Moral of the story is: wear your Jayne hat with pride, but take it off once you’re in the theater. You never know who’s behind you. Jayne hat orders have slacked off some, although I’m still getting them. It’s all to the good, though. I’ve come to the conclusion that the only way I can fill gift requests is to start slotting them into the queue as if they’re paid orders. Otherwise they get pushed to the back and never done. I started Tyrathia’s scarf… when? April? Oy. It’s a little further along than this picture, but not much. I’m contemplating setting aside part of wearwithstyle specifically to sell patterns – I’ve got some cute ones. And my daughter gave me an idea yesterday for something that I think would be quick, fun, and sellable. 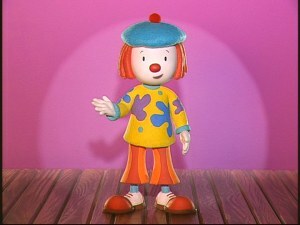 Also, I’d like to knit her a sweater that looks like the shirt worn by JoJo of “JoJo’s Circus” on Playhouse Disney. We don’t get anything but basic cable, but my father is so sweet and records the shows for my daughter. She loves clowns, and she wants to be JoJo for Halloween, although I think the Disney store costume may be too small. I had to drive my cousin’s family somewhere yesterday, and I noticed that my six year old girl is as tall as their ten year old son. She’ll outstrip me easily before long. Sometimes it can be tough to find cute girly things that aren’t all Brittney-fied. Of course, for the sweater, I’d have to find the time to make up the pattern and then to knit it. If I did, I’d probably offer the pattern for free, since House of Mouse is notoriously touchy about people selling Disney-related paraphernalia. Looking forward to some quality knitting time during “Lost” tonight. We’d better hear about the raft, or I’ll be very irritated! Why, I do believe it is! Okay, almost. But really, who needs an excuse for candy? Tvini goes trick-or-treating, dressed up as Wonder Woman. angel_fly gives you 6 light orange coconut-flavoured gummy bats. aunt_reexy gives you 3 white vanilla-flavoured gummy worms. ceosanna gives you 13 mottled green mint-flavoured gummy bats. drbubba gives you 11 dark blue banana-flavoured jawbreakers. houseofdanie tricks you! You get a piece of paper. jennnlee gives you 12 purple watermelon-flavoured pieces of taffy. kwiltbank gives you 7 light orange peach-flavoured pieces of taffy. pambunny tricks you! You get a clothespin. vaeldriil gives you 4 blue coffee-flavoured nuggets. vaschon tricks you! You get a used tissue. Tvini ends up with 56 pieces of candy, a piece of paper, a clothespin, and a used tissue. I posted this as a reply to a question over in the knitting community, then realized it said more about my life than I thought, so I wanted to post it here so I’d have a record. 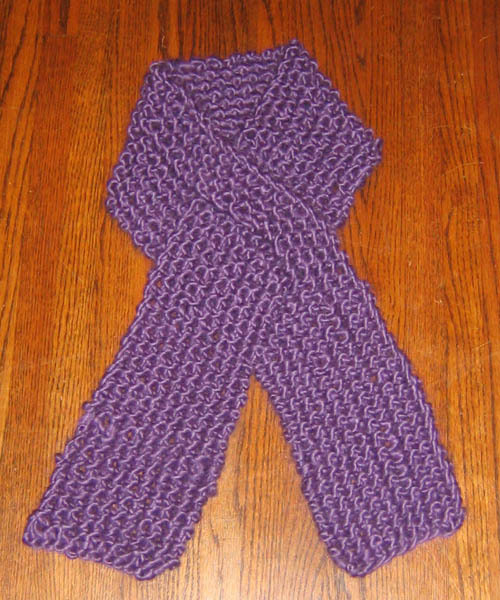 Here’s a seed stitch scarf. Never mind the slit, it’s just the chunkiest seed stitch one I had. I didn’t write down the pattern, but I’m pretty sure it’s just CO 11, *k1, p1* across. Repeat until the scarf is as long as you want. The key is that on each subsequent row, you knit the knits and purl the purls, so it has to be an odd number for that particular pattern to work. If you want to do a slit like that, it’s pretty easy. About a third of the way up, start knitting with a separate ball halfway through the row. Continue knitting from the separate balls (or just the other end of the same ball if you’ve only got one) until the slit is as long as you need, then rejoin it with the original ball. Weave in the ends when you’re all done. I gave that scarf to my kid’s kindergarten teacher’s assistant last year. Did she thank me? Nooooo. Of course, later she quit, apparently because they were expecting more of her than she had to do at last year’s school. I didn’t like her anyway – she was impatient, and unintentionally (I hope) belittling to the kids. I meant the scarf as something to try to show her were were all in this together and thus to improve her attitude. Yeah, that didn’t work. It just goes to show why you shouldn’t give hand-knit things out of a sense of obligation, only out of a genuine desire to please the recipient. Too bad – it looked better on me than I’m sure it did on her. My heavens, it was nice to get an order for something other than a Jayne hat. Don’t get me wrong, I loves the Jayne hats, but after 63 in a row, a break was good. I love the moxie of the teenager ordering these – he’s going to be the coolest geek in his school. The shell of the adult-sized dinosaur hat. Not so fearsome now. Looks like it’s got curlers in. Those will be earflaps. It’s late, but I set a goal for myself of getting this much done today, and that goal was stymied somewhat by unexpectedly having to give my cousin’s family a lift across town. I also didn’t get to mail a Jayne hat off to Toronto. I’ll be busy tomorrow! On the up side, Eoworfinia got her invitations tonight, so weddings are proceeding apace. Well, my six year old will be jumping on my bed in about five hours, so I reckon I’d better hit the hay.